Joan Gillard graduated from Ohio State University and worked as an Occupational Therapist for 30 years before recently retiring. Her work experience includes adult rehabilitation in outpatient settings, in-patient rehabilitation, home health and low vision rehabilitation. In 2007, she worked with Dr. Suleiman Alibhai and Terri Nguyen, low vision OT at the INOVA Hazel E. R. Widner Low Vision Center in Annandale, VA. In 2008, she began working in private practice, seeing low vision patients in their home environment. Describe the patient population you worked with. I saw mostly adult and geriatric patients, from 60 years on up to 100. I saw them in their homes. Most of the patients that I saw had macular degeneration, while others had retinitis pigmentosa, diabetic retinopathy, or glaucoma. And then there were patients who had neurological events like a brain injury, stroke, or brain tumor that caused vision deficits. Sometimes the folks I saw had cognitive deficits, minimal memory deficit or more severe dementia problems. Some had physical problems like arthritis, multiple sclerosis or hemiparesis. Many of them had hearing impairment. So, these challenges were integrated into the approach to their vision problems. Usually, by the time they would see me, they didn’t have acute medical problems. 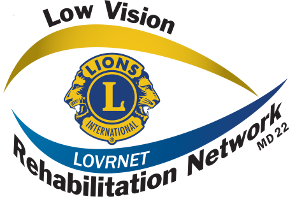 If they were having serious medical problems, cardiac problems, or something like that, they usually didn’t pursue vision rehabilitation until they were more stabilized medically; then they could really concentrate on learning the vision strategies. What does the low vision occupational therapist look for when assessing home safety? I would begin to evaluate safety concerns as I drove up to their home, apartment building or assisted living facility. That would include assessing the entrance, how many steps there were, whether there were hand railings, contrast, lighting, that kind of thing. Once in the home, I would be looking for things like tripping hazards or area rugs that slide. I would look at their lighting and pay particular attention to the ambient lighting, but also the task lighting. Would the patient be walking from well-lit areas into very dark areas, islands of light into very dark areas? That is dangerous because people are adjusting to light differences, and their eyes usually react slower than normal and then I would look at contrast. One example is a couple whose laundry facility was in the basement. There wasn’t very good lighting over the stairs. The stairs were painted gray and to the patient it just looked like one big long slide of gray. We highlighted the edges of each step with white, that way the patient was able to see where one step started and the next ended. It is important to make sure a patient knows where the last step is, and sometimes that is just a matter of putting a non-slip rug at the bottom that is a contrasting color to the steps and the floor. Task lighting is defined as what the patient is using when doing a specific, close up task. I relate that to fall prevention and safety. I always recommend task lighting in different work areas, such as where patients are going to prepare food, do paperwork, write checks, read mail, change batteries in their hearing aid, measure insulin, or organize their medications. Having multiple task areas around the house with good lighting is very important. Then, the patient is not walking to a window or one good lamp, leaning over and trying to complete these near tasks. They are able to sit where they have all the needed equipment or supplies and complete the task. Glare control is also important, and probably the majority of people that I worked with were more sensitive to glare. Glare decreases one’s contrast and decreases the ability to see detail. It is a fall risk both inside and outside. If a patient has a glass top coffee table, TV screen, computer screen or a mirror facing a window and the light is glaring off it, that’s a problem. Rearranging some things to eliminate the glare or fitting windows with sheer curtains, or even better, blinds, will help. The other thing is organization. First, making sure they have their work areas set up. Second, making sure they have access to the window, since they may have to adjust the blinds because of weather conditions or time of day. It is important to make sure there is not a lot of clutter or a big piece of furniture in front of the window so they can adjust the blinds safely. In the kitchen especially, a lot of the folks used microwaves instead of ovens. It was important to have a countertop nearby. When they opened the door of the microwave they could pick up the dish and set it down right away, without having to turn and walk across the kitchen using both hands to hold a hot dish. In the bathroom, sometimes people had grab bars installed around the shower or the tub. If they happened to be white grab bars on white tile, we would mark those with a black contrasting tape. I also made sure they had good lighting and rugs that were non-slip, low pile, and without fringe. I also assessed whether there were any fire hazards in the home and whether they had pets. Usually, people’s cats or dogs seem to be able to get up and move out of their way when the patients were walking around the house. However, sometimes the pet food or water would spill on the floor & cause a slipping hazard. How does the Occupational Therapist approach the patient when recommending these multiple changes in their home and life? 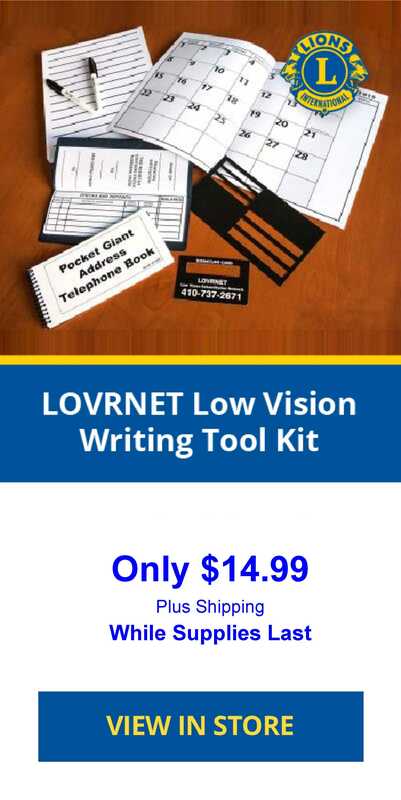 I worked in home health for 12 years before doing low vision rehabilitation. It is important to respect that you are in someone’s home. Always ask permission before going into another room and let them lead the way. If it is raining when you get there, take your shoes off when you enter so you are not tracking anything in their home. Remember you are not in the clinic, so you always want to respect that this is their home turf. So never just walk in and start saying, “ You need to do this, you need to do that.” We build a lot of rapport when first walking in. Spend time getting to know the person. Find out how they are feeling about all this. Are they depressed, are they frustrated, are they just raring to go and can’t wait to hear what you have to say? Making sure they know you are there to work as a team with them is vital. You are going to be figuring these things out together. You are evaluating and getting to know each other on that first visit. The next step is figuring out which goals and things are most important to them, and what their priorities are. It is usually really good to try to accomplish at least one functional goal before you leave that first visit so that they feel like they have already made some progress. Then they want to know what you are going to demonstrate the next time you come. So, you are collaborating with them, you are empathizing, you are encouraging and problem solving with them. It was also good to let them know that if one strategy doesn’t work, that’s not the end of the road. There are a multitude of approaches, including more technical ones, that are options. These are all effective approaches. What helps a patient be successful when learning new strategies for daily activities? Positive attitude definitely has a lot to do with it. It helps if their other skills are intact and if they don’t have a lot of other sensory problems, memory problems, or are not severely hard of hearing. You can come up with strategies though for people if they have memory loss or if they have some hearing loss. One thing that I found was that if a person has been a strong problem solver all their life, this is already going to help. They have already tried to come up with ways to deal with their vision impairment. It may be to the point though where what they are doing is not effective any more. They want to know what else they can do. If people have the ability to advocate for themselves and they are not feeling like victims, they are ready to do whatever it takes. Communicate to other people around them that maybe they need a little assistance here and there and support for utilizing the new strategies that they will learn. Maybe they are afraid to ask for help. Hopefully, they can establish some realistic priorities and goals. If somebody keeps repeating in my first couple of visits that they really want to drive again, but legally there is just no way to do that, I gently try to bring them back to more realistic goals. If they are resistant to anything being changed in their home, especially if they have been living there a very long time and don’t want any furniture moved or don’t want any different lighting fixtures or markings on anything like the microwave, then it makes it difficult. So being flexible and open to new ideas and new strategies and adaptations really helps a lot. The other thing that really helps a lot, is not just with them, it is with another person living in the home with them, whether it is a spouse or a grown child or a friend. If that person is supportive and allows the patient I am seeing to speak for themselves and help figure things out, that is very helpful. This may involve something as simple as the organization in the refrigerator, so that the person can find things and this person living with them supports them and doesn’t put things in the wrong place time after time. On the other side of that, sometimes the family member allows the patient to depend on them too much. I will go through a list of ADLs (activities of daily living) assessing if they have difficulty with them. If their response is, for example, “I can just ask my husband what time it is or, I can just ask my husband to heat up my coffee for me.” If that is what I am hearing all the time, then we need to work together to get them out of that patient role and back into being more independent in a safe way. More active engagement is beneficial physically and mentally. This is good, not only for them but also for the caregiver, because the caregiver may burn out. What are some of the most common challenges to the patient’s experience? One of the most obvious ones is spot reading or sustained reading. By spot reading I mean being able to read short pieces of necessary information, including medication names, telephone numbers, instructions on the microwave meal. And then sustained reading mostly, one for pleasure and also for access to news and current events so they do not feel cut off from the world and they have some good mental stimulation. Then, on the other side, writing is a challenge - being able to write reminders to themselves, phone numbers or lists, fill out a check or do a crossword puzzle. A lot of the older ladies that I would work with really missed being able to write a note to a family member or a friend on a greeting card, a get-well card or a birthday card. Being able to read the time could be a challenge. A lot of times people have had a watch for years and years, maybe it really meant something to them. It was given to them, but it had a tiny watch face and no contrast at all. If they really worked hard and the light was just right they could still read it. We would try to come up with an easier strategy to tell time. I would tell them, every little thing you can do to make each of these tasks a little easier with less time doing them is all going to add up in the end. Some people would say, “Oh yeah, I have trouble with that” when I asked “Do you get the toothpaste on the toothbrush?” Meal preparation was a challenge, in particular, being able to set the microwave, the timer or toaster oven. People don’t have as much trouble organizing their medications as you would think they might. A lot of times they had already come up with their own strategy to deal with that and make sure it was accurate. But in the process of doing that, pills would sometimes fall on the floor, and they would not be able to find them. And if they had a cat or a dog they were especially concerned because the cat or dog might eat it. So, we would talk about things like being able to coral what you are doing so that it doesn’t fall on the floor. Maybe using a little tray or a small cookie sheet with an edge on it. Then line it with something so that if you do drop a pill it isn’t going to bounce off the hard surface and bounce onto the floor. Making sure that there was a contrasting solid color, so they can tell one pill from the other, so they could tell where they were. So, just some simple organizational things like that would prevent dropping pills on the floor. Keeping track of mail and financial documents and files was really frustrating a lot of times for people. I would show them samples of file folders labeled with pencil or pen and a dark marker or a bolder large print on a white label and they would see for themselves which one was easiest to see. We would use contrast and larger print and things like that. We would try a gooseneck lamp on top of the file cabinet so we had good light shining onto the file folder when they opened it up. Setting the washer and dryer, making sure they had the correct settings is a challenge. Another thing people had difficulty with was purchasing something on the phone and using a credit card. Sometimes they could not read the credit card number on the card, and so we would come up with ways to compensate for that. Those were some of the most common challenges. Another was lighting in closets that is notoriously bad. We would look at ways to improve lighting, so they could determine the color of clothing. Then they would know what they were wearing and if it was matching. They could use a little LED flashlight to help with that close-up but then I would also have them remove the light cover in the ceiling and put in a brighter LED bulb. It would have no heat and be much brighter. And then they would tell the color of their clothes better and be able to see things better. This article is based on the transcript of a telephone interview between PDG Ted Ladd, District 22-C, and Occupational Therapist Joan Gillard.